ãRelief Your Handsã: Our Giantex portable full automatic laundry washing machine only needs a small space for store, which is a solution for compact living. Once you set the washing machine program, you could just leave it alone to work and do your own staffs. It could relief your hands and you could use the time to do other things. ãWater Level and Mode Controlã: 5 Programs for choosing: wash-rinse-spin, soak-wash-rinse -spin, wash, wash-risne, rinse-spin, spin. With 3 water level: L/16L M/23L H/30L. You could adjust the different washing mode through the wash push-button and control the water level via the switch. Different clothes have different washing and water level requirement. You can stop wasting hours keeping an eye on washing machine for its full automatic cleaning mode. 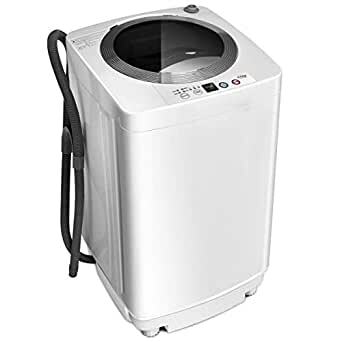 ãLarge Wash and Spin Capacityã: This Giantex washing machine is compact and lightweight for you to easily move it in your home or department. But the honeycomb shaped inner tub can load 8 lbs at one time and wash many clothes for you. In manual, we also listed reference weight of various clothes. ãFull Automatic Machineã: This machine features a built in drain aluminum pump and a drainage tube which allows you to easily drain out dirty water, which is good choice for apartment or dorm doing medium or little weight laundry. ãEasy to Operateã: This product has straight forward illustrations and descriptions. There is no installation need and easy to operate. It won’t take you much time and could take convenience to you. If you have any quality problem,please feel free to contact us, our customer service will reply to you within 24 hours.